GREAT FOR PULLERS: The Front Range features two leash attachment points: one on the chest up front for more control when your pup's still training, and one on the back for more relaxed walks. A STRONG CONNECTION: The aluminium attachment rings are reinforced with webbing, providing a safe and durable connection. 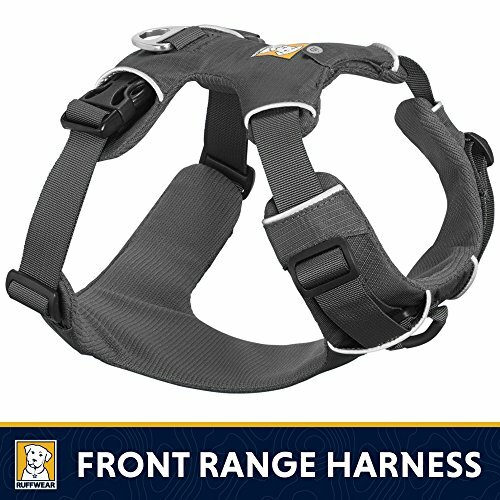 HASSLE-FREE HARNESS: The Front Range Harness is designed to slip over your dog's head and stay secure with side-release buckles, making it easy to gear up and get out there. DESIGNED FOR DOGS: The padded chest and belly panel offers all-day comfort for extended walks, runs, and hikes. Get a customizable fit for your pup with four points of adjustment. THOUGHTFUL FEATURES: Tuck ID tags into the built-in pocket for collar-free adventures. With reflective trim, you and your dog can get out earlier and stay out longer.